Finally! Something new to share! 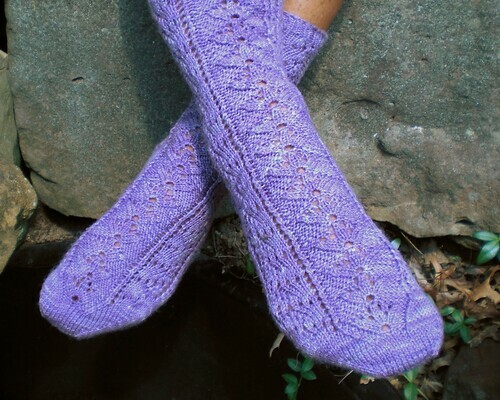 I was invited months ago to design a sock pattern for the August installment of Three Irish Girls' Sock Yarnista Club. Betony is now available for purchase directly from Three Irish Girls. Betony is worked from the toe up and, although the toes aren't worked on the diagonal like Skew, they are shaped to be left- and right-footed. I'm in love with asymmetric sock toes. Not only are they more comfortable, but they also wear more evenly than symmetric toes because the strain on the big toe is eliminated. Unlike arch shaping on top-down socks, which places increases on the sole of the foot, toe-up arch shaping places decreases on the bottom of the foot. The double layer of stitches in a decrease is more durable than an increase. And of course they feel great snugged up into my arch. I'm particularly happy with the heel. For a very long time, I've used a toe-up heel with the same structure and proportions as a standard top-down flap-and-gusset heel, but it involves knitting a shaped heel cup and then picking up stitches around it. Personally, I don't mind picking up stitches; but I know some people do. And most toe-up heels with short row heel cups are either way too shallow or have way too many gusset increases (but that's a rant for a whole separate post). So for a change, Betony's heel has the same proportions as my usual heel, but the cup is shaped with short rows instead of picking up stitches. By the way, the heel flap is patterned at the sides, but I left the center of the flap plain since that area is prone to wear. However, you could certainly pattern the whole flap if you want to wear Betony with clogs. And now for the bad news: there are a couple of errata. 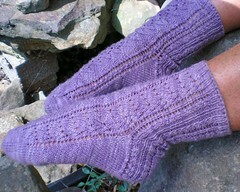 I've posted them to Betony's Ravelry pattern page, but I'll repeat them here. In the Double Rivulet Rib chart, the three central columns should be (p1, k1, p1) instead of (k1, p1, k1). In the Ribbing instructions, the Right and Left sock instructions are switched.